So, I have found a room, I’m just not sure which room it is yet. How many rooms did I email to find it? Probably over 250 (I have 140 messages still in my inbox relating to rooms (I have deleted a number of them), and would have received about 30 or so in my Appartager inbox – and these are just the ones that replied). A number were clearly scams (interestingly, I first tried Craigslist in early July, and then pretty much everything was a scam. Then, in mid-August, I found some serious rooms on Craigslist – I’ll include some scam emails in a later post so you can see what to look for); others just seemed creepy; two I went to visit but couldn’t contact the owners when I reached the front door, so didn’t end up seeing them; some people had already found housemates when I contacted them; and many people just didn’t get back to me – probably due to language concerns. That being said – finding a room was much easier for me in London. Even before I knew anyone. 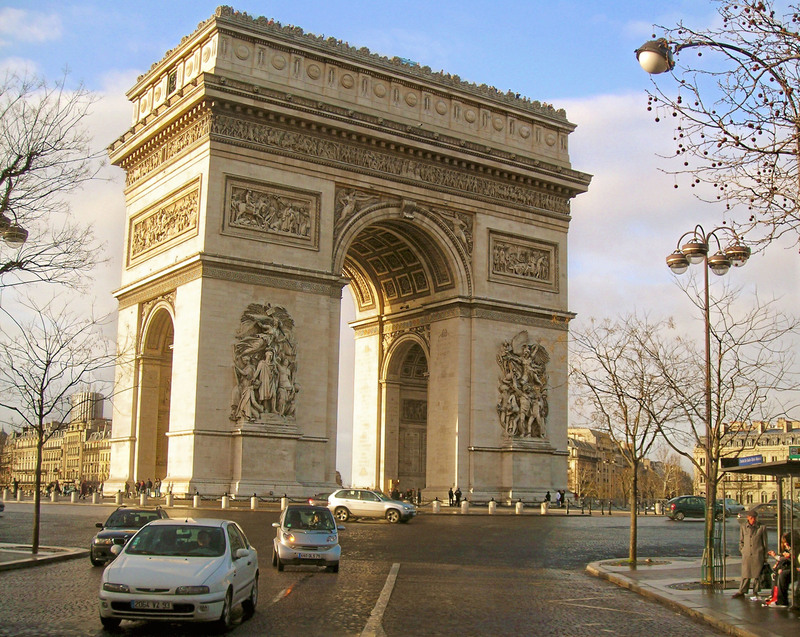 For those of you planning on coming to Paris at some point – expect your room search to take a while if you don’t know anyone, and accept temporary rooms while you look, as they’re much cheaper than hotels and hostels. I left the metro at Barbès – Rochechouart and walked to the address, noting that there was an abundance of shops, people and noise in the area. As I turned down the street, I grew excited. Those of you who have been to Paris will know that the Sacre Coeur is on a hill and is surrounded by trees. Some of these trees were at the end of the street – I was only a few hundred metres from the Sacre Coeur! The building seemed to be some sort of student dorm, and the room was only available for September (this wasn’t a problem – I had eight days left to find a room, so I figured this could give me time to find something else). The girl who showed me the room was nice, and the flat wasn’t bad (a double mattress on the floor of the bedroom, a tiny kitchen and bathroom, but the location made up for it), but it cost more than advertised. “So, it’s €525 for September?” I asked. This was likely to be more than I had readily available at the start of September, but I decided to keep the room in mind in case I hadn’t found anything else by the end of the week. I had now been in contact with Bénédicte for close to two months. 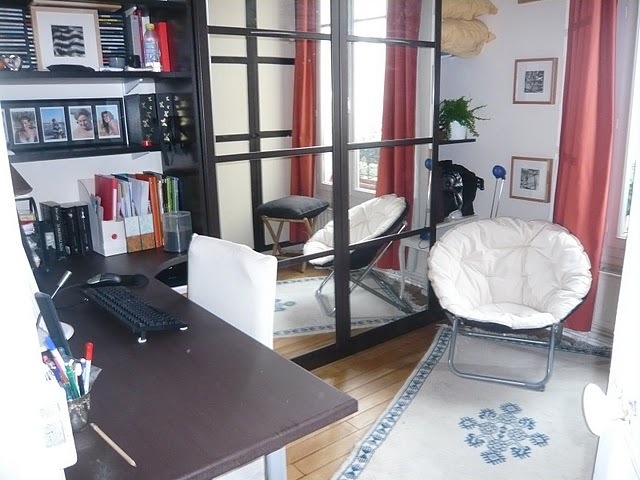 I found my first room in Paris (where I stayed for a whole 17 days before another girl moved in) in Fusac. A few days before I moved out, I received an email from one of the landlady’s friends, Bénédicte, saying that she had a room available from July 10th. Having already seen a room in this area, I knew it was a beautiful place, so emailed back saying that I was definitely interested, but that I didn’t need a room until September. Bénédicte said that this was fine, and I visited the room last week after she returned from her summer holidays. Having already seen photos of the apartment, I knew it was beautiful, and I wasn’t disappointed. 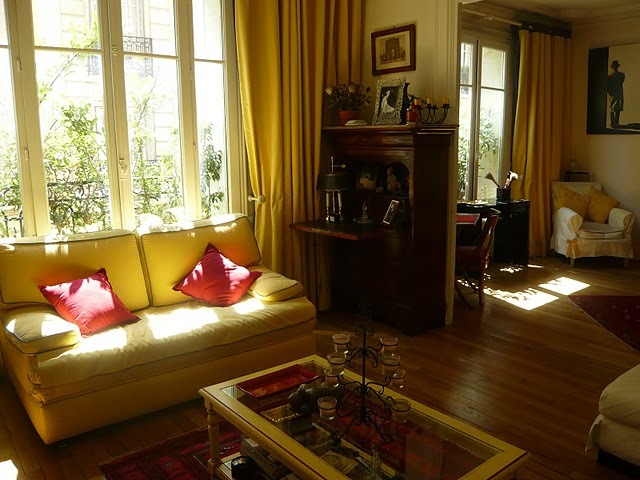 There were two joined living areas with heavy curtains with pelmets, yellow and white couches on ornate wooden feet, and warm rugs on the floor. The spare room was lovely and tiny – there was a desk on one wall, and a double bed that could fold up into the wall so that when it was tucked away it looked as though I had a wardrobe with mirrored doors (it’s so strange – I always talk about how I miss the space of Australia, but when I see something like a bed that folds into the wall, or a bar fridge being used as a kitchen bench top, my heart leaps because it seems to be so Parisienne). Bénédicte was also lovely, and I could easily see myself living here as she talked about how important it was for people to respect each other’s privacy. There was only one problem – her son was currently living in the room, and would probably be there until late September as he was currently looking for work and somewhere else to live. I told her that this was fine, that I was still interested and that I would look for something temporary in the meantime, and that I would let her know if I found somewhere permanent. When I saw this ad, I almost didn’t respond because it seemed too good to be true – a room in exchange for babysitting. Yes, I’d seen similar deals, but they were generally for cheap (€300) rooms in exchange for babysitting, not free rooms in exchange for babysitting. When I left the metro, the street was calm and clean, with trees lining the road and beautiful Haussmannian architecture. The apartment was huge – it was the entire fifth floor of the building – with large windows and lovely wooden floors. His four-year-old daughter’s room is bigger than many of the ones I’ve been looking at for myself, and she has a private bathroom! We had some green tea in the kitchen (also the largest I’ve seen in Paris) and Cory told me about what he needed. The studio (which I wasn’t able to see at that stage but, based on Cory’s character and his apartment, I think it will be in pretty good shape) was being offered in exchange for baby-sitting. An English-speaking babysitter was requested in the ad, as Cory is American and wants his daughter speaking English at home since she speaks French at school. He explained that sometimes he needs to work until 8pm, so needed someone who can take care of his daughter in the evenings and stick to her evening routine. He also said that they like to have dinner at 6pm, and usually cook using fresh food from the market – although the studio has a kitchenette, he said I would be welcome to help with the cooking and eat with them. The more I heard the more appealing it seemed – I really liked the idea of being a part of a family, even if it was temporary. There was one catch – he needed someone who would be available to pick his daughter up from school at 4:20 on most days. With my current teaching schedule, this is only possible for me three times a week. I explained my situation and said that, although I was interested, I would need to check with BTL and see if we could organise my timetable around this (after getting in trouble last week, there’s no way I’m going to try doing it myself again). Assuming everything goes well with BTL, I will then need to be interviewed by his daughter’s mother (cue foreboding music). This room was right near the Arc de Triomphe, so it was great from the bragging-rights perspective. I rang the bell at the door of the flat and it was answered by a man who seemed to be an ageing hippy – he was wearing old, flared jeans, a yellow t-shirt and a yellow or orange bandanna. The flat was small, the room was tiny, and the bathroom and kitchen needed a clean. The decor was also unusual – the main things that struck me were the animal skin rugs on the floor, and the smell (like stale air and smoke, and maybe some lingering traces of food). He seemed nice, but I really don’t like to be trapped in places with strange smells. However, I figured this would just be a short-term room where I could stay before Room 2 became available (assuming Room 3 didn’t work out), so basic comforts weren’t so important – my main priority was being dry and safe. After I saw Camille’s room, which wasn’t available until September 15th, I posted an ad about an Aussie girl looking for a room for the first two weeks of September. Olivier was one of the respondents, so I figured that this could be another short-term solution. Olivier’s flat was beautiful – warm wooden floorboards, yellow walls in the living and kitchen areas and green walls in the bedroom. The windows in the living room and bedroom looked over the building’s private courtyard, and the building was on the edge of Chinatown, so there was lots good food nearby. The only thing that worried me was that there was only one bedroom. As he showed me the bedroom, I assumed he wasn’t renting out the futon in the living room. And I wasn’t sure how to tackle this question in French. “If I decide to stay here, will I be sleeping here in the living room?” I pointed to the couch. “No, no, in the bedroom,” he assured me. “No, I will sleep in the living room,” he explained, since I was just looking for this room for a short time. Oh, the relief! Then I was able to relax into the conversation. Olivier was really lovely and we conversed for a good 90 minutes, at which point I started to get tired and my French deteriorated drastically. So we said our goodbyes, and I told him I would contact him on Monday. After speaking to BTL on Monday, they said it was possible to arrange my hours so I could have the room in exchange for babysitting, but they didn’t get back to me until today. As I needed somewhere to sleep tonight, I emailed Olivier from Room 5 and have arranged to stay there for one week, and will finalise the length of my stay on the weekend once I’ve spoken to Cory again and know whether I’ll be taking Room 2 or 3. I must admit – I’m really looking forward to settling somewhere for good – I must have set some sort of packing and unpacking record over the past couple of months!